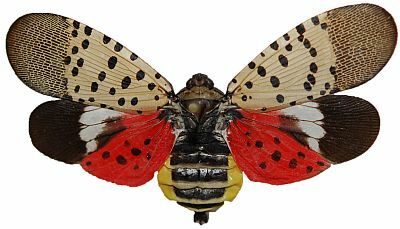 The SPOTTED LANTERNFLY is an invasive insect spreading throughout southeastern Pennsylvania. Since its discovery in Berks County in 2014, it has presented as a significant threat to our agriculture and tree population. 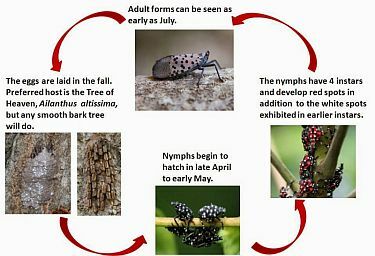 The SPOTTED LANTERNFLY overwinters in egg masses covered in a mud-like substance laid on smooth bark, stone, and other vertical surfaces. Generally, the first of its four Stages emerges in mid-May, with adult insects seen by the middle of July. It prefers the Tree-of-Heaven/Paradise Tree but can be seen feeding on other trees, including Willows, Maples, Poplars, Tulip Poplars, Birch, Ash and others. It is an insect with an insatiable appetite for our trees. When there are only a few Spotted Lanternflies, you can kill them by swatting or crushing them. Usually, a small amount of the insects is a precursor for a larger onslaught. They are a clever insect as they can catch a ride on your vehicle as well, as arrive via your local garbage truck, postal service vehicle, UPS truck… . Directly contacts the Lanternfly delivering a quick knockdown. For Small Trees and Shrubs on your property. 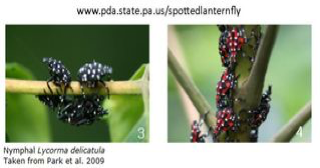 Systemic application kills the Lanternfly as it feeds on any part of your plants. For Large and Small Trees on your property.